When the summer temperatures soar, you need to stay hydrated. You can always drink water but sometimes you want something a little different. 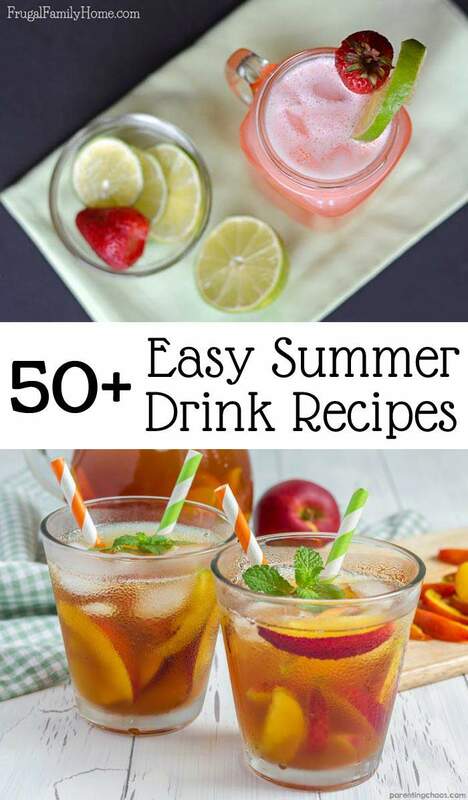 Find your new favorite summer drink or drinks out of this list of over 50 easy summer drinks to keep you cool. Some of these are sweetened with sugar, others have no sugar at all and some are sweetened with sugar alternatives. There are all kinds of drinks included, from infused waters to mocktails and everything in between. A few of the links in this post are my referral links. Which means when you purchase through them I can make a little money. Thanks! You can read more on my disclosure page. Quench your thirst without adding calories with these yummy infused water drinks. Water infused with berries, mint, and citrus is more refreshing on a hot summer day. Fresh Mint Water, a super easy refreshing summer drink that only takes mint and water. 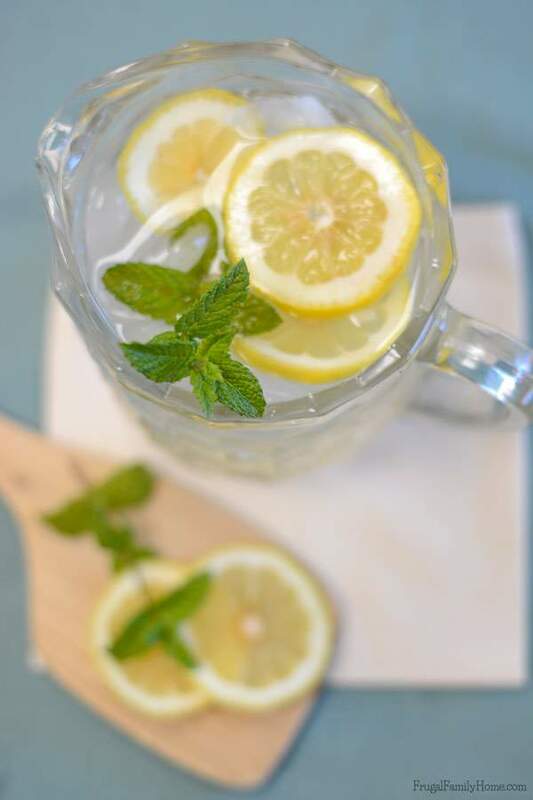 Fresh Lemon and Mint Water, A lemony twist on regular mint infused water. Just as refreshing with a hint of citrus. Strawberry, Lime, Mint Infused Water, Water even better with a little lime, mint and strawberries. Lemon Lime Infused Water, Cool down with this citrus infused water. Strawberry Stems Infused Water, A great way to be ultra frugal and have great tasting infused water too. How to use strawberry stems to make strawberry water. Frugal and Yummy! Citrus Bliss Infused Water, Three kinds of citrus make for a delicious and refreshing water drink. Tea can be a staple drink during the summer. Whether you like your tea straight or with a little sugar, it always is great on a hot summer day. You can even dress it up with a little citrus or fruit to make it even more flavorful. Sun Tea, Use the power of the sun to make your tea. This is a great beverage to get the kids to make. Peach Iced Tea, Tea with a little sweetener and peaches, it sounds so good, doesn’t it? Lemon Infused Tea, Don’t stop at just infusing water, branch out and infuse your tea too with this recipe. 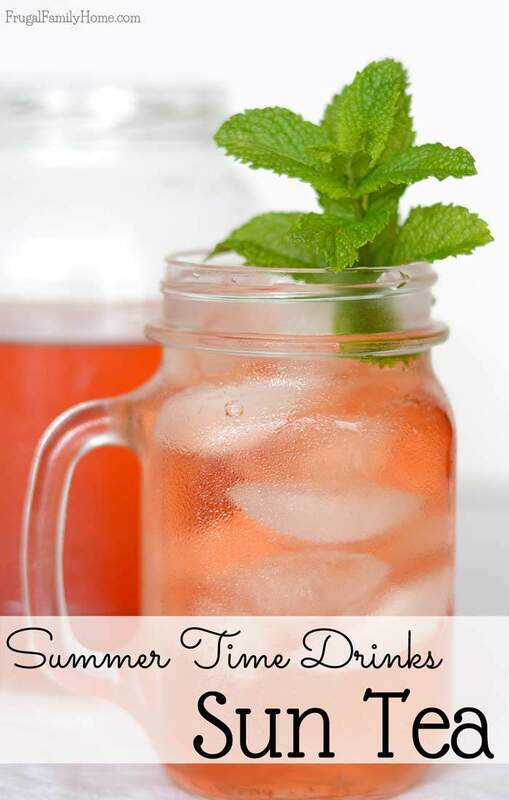 Southern Sweet Tea, Sweet Tea is my kind of tea and this one looks simple and delicious. Almond Iced Tea, A flavored ice tea with almond and vanilla extract. Southern Strawberry Sweet Tea, Strawberries, and lemon are added to this tea to make a fresh and fruit tea you’ll love. Chamomile Lemonade Ice Tea, I didn’t know whether this should be added to the tea section or the lemonade section but tea won out because I love the Celestial Seasoning tea that is used in this recipe. It’s a blend of tea and lemonade, such a great combination. Nectarine Mint Sweet Tea, Mint and nectarines in a tea sounds so good and this recipe is sweetened with Stevia. Watermelon Green Tea, A unique tea that only takes two ingredients. Sweet and tart just go together. They balance each other out and make such a great combination. These lemon and limeades go from plain homemade to mint and fruit infused. You’re sure to find the perfect one to enjoy on a lazy summer day. Raspberry Mint Lemonade, This lemonade is sweet and tart with just a hint of mint. So refreshing when on a hot day. 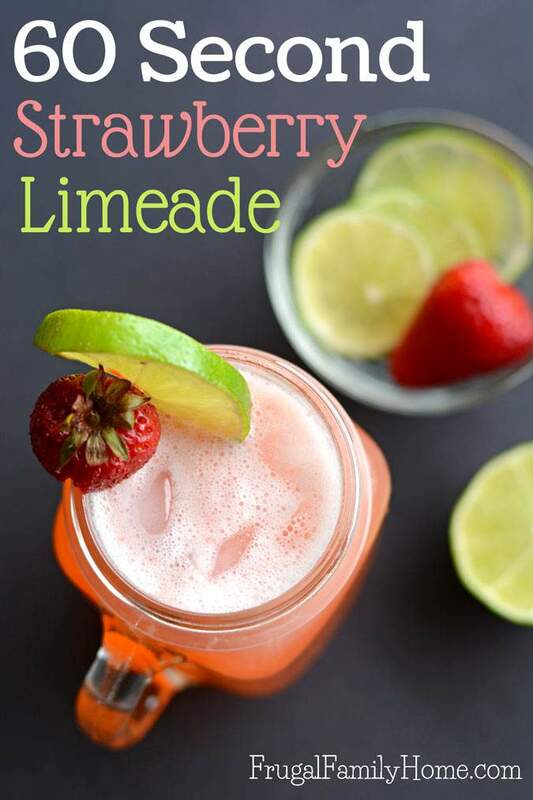 60 Second Strawberry Limeade, Another great combination of sweet berries and tart lime to make a perfect summer drink. Plus a serving can be made in about 60 seconds. Fast and delicious. Watermelon Lemonade, Watermelon and Lemonade just scream summer. Put them together and you have the perfect summer lemonade. Homemade Limeade, Enjoy this homemade limeade when you feel like having a classic drink to enjoy. Pink Lemonade, What makes this lemonade pink? Why it’s the cranberry juice, what a great combination. Mint Infused Lemonade, Give your classic lemonade a little hint of mint to make it even more refreshing. Fresh Squeezed Lemonade, The perfect recipe when you want lemonade, skip the powder mix and make this fresh squeezed version instead with a little orange juice in it too. Skip the slushies from the convenience store and make your own at home. You’ll save money and you won’t have the leave the house to enjoy a cool summer drink. Root Beer Slushie, Easy to make with a little root beer and ice. So easy and quick too. 60 Second Frozen Hot Chocolate, Hot chocolate in the summer no thanks you say? You need to try this cooled down version that can be made in about a minute and is so delicious too. You’ll look for a reason to have hot chocolate in the summer. Orange Pineapple Slush, This recipe reminds me of an orange julius, but with pineapple added too. Root Beer Freeze, Only 2 ingredients are needed to make this root beer freeze. Maybe you have them on hand right now? Blue Raspberry Slushie, Make your own slushie at home with a few ingredients. I was surprised what was used to flavor this slushie. Watermelon Lime Slushie, This slushie is great when you have fresh watermelon on hand. It looks so delicious too. Raspberry Lemonade Slushie, Another yummy slushie using real fruit. I’m going to have to give this one a try with some of my frozen raspberries from the freezer. Tropical Slushie, Peaches and pineapple make this tropical slushie. Sounds like a great combination. Fruit Punch Slush, Only two ingredients needed to make this slushie. Start your day with a cool and fruity smoothie or have a delicious, rich milkshake for dessert. 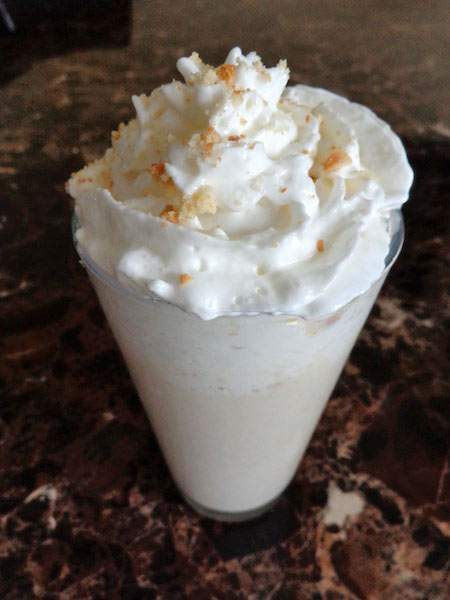 Coconut Coffee Milkshake, I don’t like coffee but I do believe this would be a delicious shake. Banana Pudding Milkshake, Yum, banana pudding in a shake, I would have to say yes to that kind of milkshake. Chocolate Peanut Butter Banana Shake, Such an interesting combination. S’mores Coffee Milkshake, Coffee with s’mores I think this shake sound so yummy. Strawberry Dreamsicle Shake, Bananas, strawberries, and orange juice makes a delicious combination for this yummy shake. Pokemon Dairy Free Pokeball Shake, An interesting combination of strawberry and coconut milk to make a shake to enjoy. Peanut Butter Oreo Shake, Cookies and candy blended up into a milkshake. Pineapple Coconut Smoothie, A healthy and dairy free smoothie with the taste of the tropics. Copycat Chick-fil-A Frosted Lemonade, I’ve never been to Chick-fil-A but I think this copycat recipe looks so yummy. But then I a sucker for anything with ice cream in it. 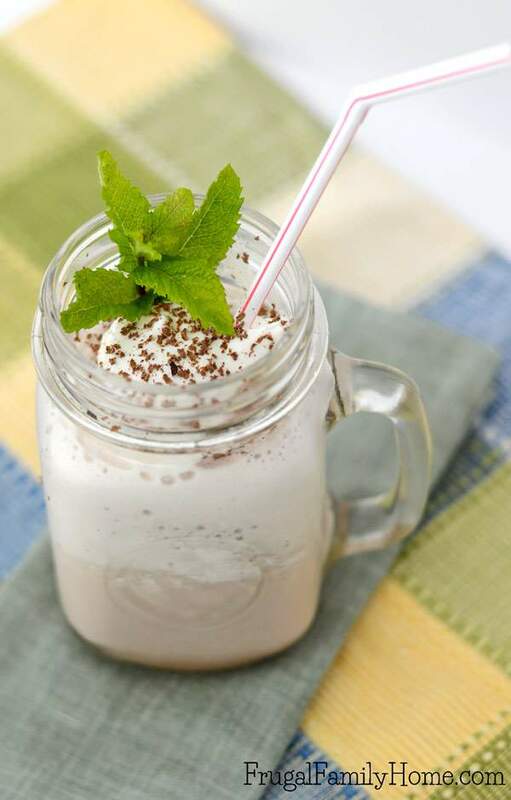 Pineapple Mint Smoothie, A healthy dairy free smoothie with mint. Mango Coconut Smoothie, A thick, delicious, and dairy free smoothie. Pineapple Smoothie, When fresh pineapple is in season this would be a wonderful breakfast treat. Pineapple Orange Creamsicle Smoothie, I love creamsicles and this smoothie would be like having a creamsicle for breakfast. Classic Strawberry Banana Smoothie, How can you go wrong with a classic smoothie like this one. It’s one of my favorites. Having a party? 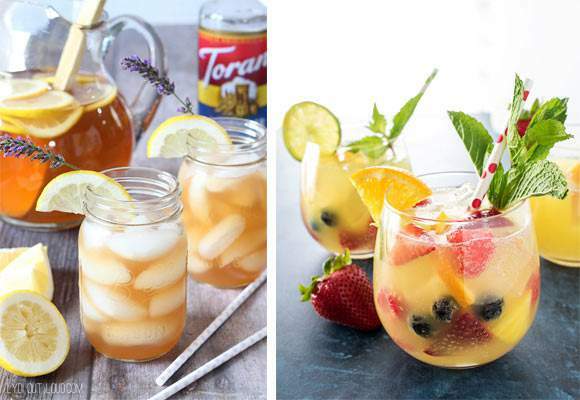 These mocktails and punch recipes are perfect for a summer gathering and there are so many to choose from, I’m sure you’ll find one to serve at your next party. Cherry Lime Rickey Mocktail, I used to love having lime rickey mocktails at one of our favorite restaurants. This is one you can make at home. Hawaiian Sangria Mocktail, A fizzy, fruity, and sweet way to quench your thirst. Lavender Arnold Palmer Mocktail, Lemonade, tea, and lavender syrup is all you need to make this interesting mocktail. Copycat Sonic Ocean Water, Make your own sonic water at home with just 4 ingredients. Raspberry Sherbet Punch, My mom used to make this punch and it’s one of my favorite punches to make. Great for a pink themed party. Tropical Orange Sherbet Punch, Tropical punch with a sherbet to chill it. Fizzy Pineapple Punch, You only need 4 simple ingredients to make this fizzy punch. So pretty looking too. Star Wars BB-8 Punch, A fun punch that would be great for a summer star wars get together. Shark Attack Punch, 3 ingredients to make this fun punch that I’m sure your kids would love. What’s your favorite summer drink to enjoy when it hot? 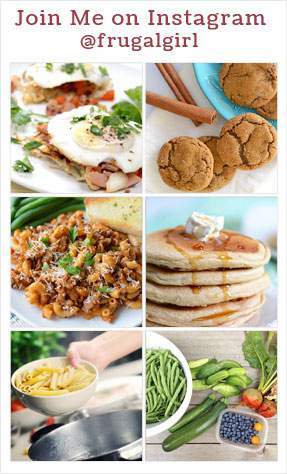 Thanks so much for including my recipe! Scheduling some social shares now. 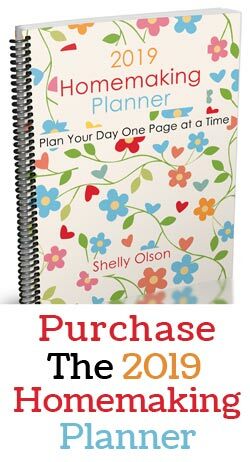 Feel free to grab from my site anytime it fits your needs! Your Welcome Krystle. Thanks for sharing it.